I learnt this tomato ginger chutney recipe from my lovable sister Radha. Bascially I love to try different side dish for idli, dosa everytime.Being a South Indian, most of the days, our breakfast would be either idli or dosa.So I keep thinking and searching for varieties of side dishes and that too I pay special attention to tomato chutney recipes because tomato is my most favourite vegetable.I love anything based on tomatoes. My dad had told many times about this tomato chutney with ginger flavor and it tempted me to try.We loved its flavour a lot. As tomato prices have crashed, I bought 2 kgs last week and I tried some yummy, interesting recipes with it. So this week, I have planned to post them one by one :) Stay tuned ! Wash and chop the tomatoes,onions roughly. In a kadai,heat oil and saute the onions,tomatoes,red chillies adding the required salt.Saute till tomato turns mushy.Add tamarind,mix well & let it cool. After it cools down,add the ginger and curry leaves.Grind them to a smooth ,semi solid paste adding required water.Set aside. Heat oil in a kadai,temper mustard,urad dal and saute onions till transparent. Now add this chutney and allow it to boil well for few minutes.Remove after it becomes slightly thick. Serve with hot idli,dosa ! Prepare this chutney at least 30 minutes before serving so that all the flavors gets enhanced by the time u serve. Add more red chillies based on ur taste. U can also add a tbsp of grated coconut for variation. 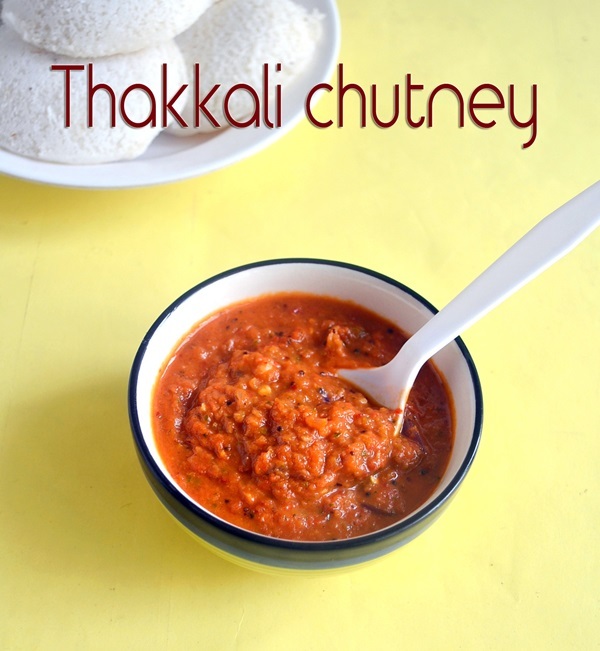 Enjoy this chutney with hot idli,dosas.It tastes yum!! we too try with corinader leaves insted of curry leaves ...Def best chutney with dosa/idlis..
Easy & yummy chutney...i often make this chutney for wheat dosa :) inviting pics! love tis version.. spicy n inviting.. Delicious looking chutney, yummy with dosa and idli. healthy chutney for idlis n dosas! Simple and perfect side dish for idly. Very yummy ! !